Hellfire differs from earthly fire. While earthly fire only affects the souls by means of the body, that which the wrath of God enkindles directly tortures the spirit. In this chapter, we will describe more systematically, the two fundamental punishments of Hell: the pain of loss and the pain of the senses. The pain of loss is suffering par excellence and the greatest punishment that man can suffer. It consists in his definitive exclusion from eternal life and the irremediable loss of his highest happiness, namely the privation of the beatific vision and possession of God. Hell essentially consists in this most frightening punishment, and all the others are only a mere consequence of it. One could object that the pain of loss can not be that terrible, because, while on earth we are deprived of the beatific vision without much affliction. However, on earth this deprivation is simply the privation of a good not yet due to man, and whose possession is still possible. However, for the damned, it is the privation of a good which should but can never have, and thus he suffers immensely. In this life, we understand immeasurably less about God as our sovereign good, and the vision and possession of the creatures that surround us serve as a distraction from the thought of the Highest Good, thus calming our innate desire for happiness. We find entertainment and joy in creatures. However, after death, we are deprived of all goods, and only the vision of God will make us happy. More than a fish needs water, we feel an urgent, imperious, constant and uninterrupted need of God, about Whom we will not stop thinking even for an instant. While the companionship of other souls will be a joy for those in Heaven, for the damned those that surround them, far from bringing relief, or even distraction, will only augment their torture. Furthermore, the punishment of damnation is not equal for all the condemned. The affliction of each reprobate, differs according to his culpability. The more culpable he is, the more tortured he will be for having fallen more deeply into the dark and terrible abyss of sin. The torments of the senses consist above all in the fire of Hell. It is a real fire, but mysterious, similar and different from earthly fire. Because we can know about the afterlife only by comparison with things of earth, we could assert that the fire of Hell is analogous to our earthly fire. However, at the same time, it is different. The exact measure of this is impossible to specify. Similarities: While the Church has not defined the fire of Hell as material, it is designated by the term of fire or flame around thirty times in the New Testament, at least eight times of which are in the Gospels. This language would not be used if the punishment of fire (the most terrible punishment here on earth) did not have an intimate connection with the punishment of Hell, and if it were not the most appropriate illustration of its severity. - Natural fire is produced as a result of certain chemical operations while the fire of Hell owes its origin and its subsistence to the wrath of God. - Natural fire only operate on souls through means of their bodies while infernal fire directly tortures the spirit. - Natural fire will extinguish itself while that which the wrath of God enkindles, will burn forever. - Natural fire illuminates while the fire of Hell produces darkness. - Natural fire consumes what it burns, the infernal flame burns and tortures its victim without destroying him. How does the fire of Hell work? How can material fire burn a pure spirit like the devil or a damned soul before the final resurrection? Beginning with Saint Thomas, practically all theologians are in agreement that this action of matter over spirit is naturally impossible. The material fire of Hell can only act over spirits through an action of God whereby the fire produces a special effect that reaches the soul. In order to act over souls, this effect must also have an immaterial nature. The eternal fire does not burn the soul of the reprobate or demon, but shackles the spirit, impeding it from moving freely. This enslavement is not just local, extrinsic to the spirit, but is a modification that is incorporated into the faculties of the soul, preventing the free use of the intelligence, memory, imagination and will. For example, the imagination cannot free the soul from present torments or entertain it with agreeable thoughts and pleasant memories. Even when the demons leave Hell temporarily with divine permission, they do not escape the imprisonment of this fire. Even outside of Hell, they remain under its action which directly impedes the use of their spiritual powers. Thus, owing to this continual action, they suffer the lack of freedom that the fire of Hell causes them, as if the fire were near to them. This is analogous to a blessed Angel who, leaving celestial places, retains the vision of God (the light of glory). The opinion that there might be ice and water in Hell, whereby reprobates go from the heat of fire to the frigidness of ice and water, is not supported in Scripture. Theologians also explain that the reference Our Lord made to gnawing worms signifies the remorse experienced by the damned and demons. Although we cannot know where hell is with certainty, the opinion of Church Fathers and theologians has always been that Hell is in the center of the earth. Can we know where Hell is? As the theologians point out, by natural reason we cannot know where Hell is. Revelation did not speak clearly enough on this nor was it defined by the Magisterium. Still, the opinion of the Church Fathers and theologians has always been that Hell exists inside the earth. Not only does the language of the Scriptures support this, but because there is space and fire in the interior of the earth, nothing is reasonably opposed to it. Besides, the Latin word for Hell, Infernus, indicates an inferior place, and therefore reinforces the common belief that it is subterranean. But all this is mere speculation which cannot be verified and does not hold real importance. Before the resurrection of the body, the souls of the condemned and the demons are imprisoned in Hell by the infernal fire, as was already explained. 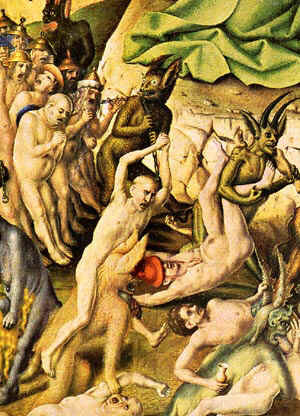 While the demons can leave Hell to tempt men, the question is more difficult to answer with regard to the reprobate. While it is reasonable to think that some reprobates appear on earth through Divine permission to benefit living, it is something rare, extraordinary and, except in extreme situations, a great punishment for men. While sociability is the source of much happiness in Heaven and on earth, in Hell it greatly increases the torment of the damned. Being together with demons and the damned in Hell is also a cause of suffering. Their unspeakable depravity, creates the odious condition in which they exist. Also, the horrible punishments of the reprobates are a frightening spectacle. Therefore this continual, eternal society is an additional torment. The infernal darkness is not so dense that it prevents corporal sight. Imagine the horror of Hell, and the frightening disorder caused by the hateful tyranny of the demons and eternal and universal hatred in relation to others, which exists to such and extent that no good feeling ever exists between one condemned and another. Hating God, the final cause, they are filled with hatred for one another. They consider everyone, including themselves, contemptible and repulsive. Moreover, there are special sufferings resulting from the interaction between the sinner and his accomplices, corrupters and those he corrupted during life. For example there is a special torment for the relations between fornicators, adulterers, members of a gang, totalitarian parties or sects, or bad professors and their corrupted students. Is everything in Hell a torment? Yes. In this cursed place, about which Dante wrote, "abandon all hope ye who enter here," the damned do not receive any of the sweet and intense satisfactions the joy of living on earth affords us: lights, breezes, reasoning, rest and comfort. None of this, which is loved so much here on earth exists among the damned. They feel the privation of corporal freedom and the sensations of immensity, variety and changing ambiences. All this is consumed by the fire of Hell. Even the imagination and memory are a source of torture, since these merely feed their irremediable despair. To understand well why the torments of Hell are so terrible, we must compare them with the immensity of Divine Mercy that a reprobate refused. In choosing Hell, he rejected the Creation, elevation to the state of grace, Incarnation, Passion and Death of Our Lord, intercession of Mary Most Holy and the Saints and institution of the Church and Sacraments. God loves all men more than the most loving mother loves her son. Consequently, He surrounds them with affection and exceptional care. Our Lord went so far as to compare Himself with a hen that gathers her chicks beneath her wings (Matthew 23:37) to demonstrate this affection. The degree of refusal of this love corresponds to the amount of suffering in Hell. God is the cause of all good, beauty and truth. When one breaks with Him, he retains evil, ugliness, falsity and error. Physical and mental health depend on this ordering element of everything, Which is God. To be separated from Him is to be separated from the source of all health, well-being and sweetness. Only disease, hideousness, and suffering remain.